So what kind of chicken is an "oliver egger"? After our latest post of our incubation, I received several questions regarding which specific "breed" of chicken is an olive egger. Actually, an olive egger is not a recognized chicken breed. It is a crossbred chicken developed with the intent to produce an egg shell color that is indeed an olive shade of green. This can be attempted through various crosses of recognized chicken breeds. The key to success is to start with one parent from a very dark brown egg laying breed (Penedesenca, Marans, etc.) and one parent from a blue egg laying breed (Ameraucana, Auracana, etc.). A little further explanation of egg shell coloring is required here. Simply speaking, blue egg shells are blue all the way through to the inside surface of the egg. However, very dark brown colored egg shells are actually lighter brown eggs that are "coated" with a darker brown pigment as they move through the hen. This surface coating can be scratched or (firmly) rubbed off, revealing a lighter brown shell underneath. The various olive green shades are produced by the coating of this dark pigment over a blue egg shell. 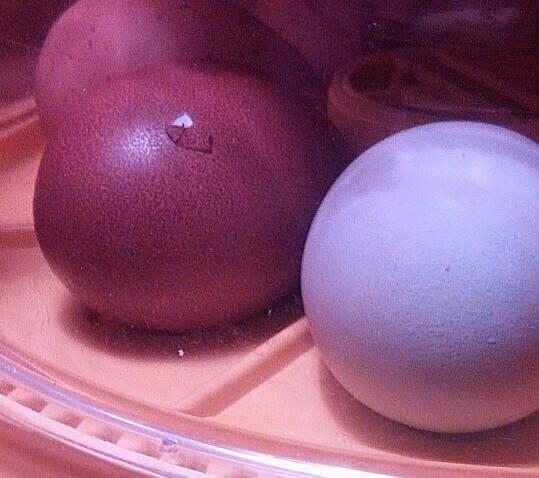 Scratches in outer coating of Marans egg showing lighter color underneath. The majority of female offspring of this cross will lay an olive egg, though a few will produce a light brown egg. 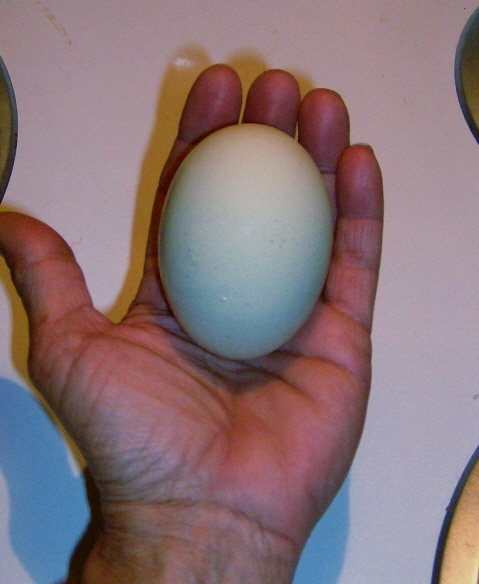 The majority of the males will carry the green egg gene and can pass it on to their offspring. Unfortunately, there is no way to ascertain whether these chickens are truly "olive eggers" until they lay their first egg, or sire their first offspring (though some breeders feel your chances are improved by keeping only those chicks with a pea-type comb). This breeding project is a bit of a gamble, but it's worth the effort for such unique color! "Olive" eggs from Marans/Ameraucana cross hens. These two days started out normal enough. Returning home from a night shift at my "real job", I followed our usual morning routine of animal care and household chores. 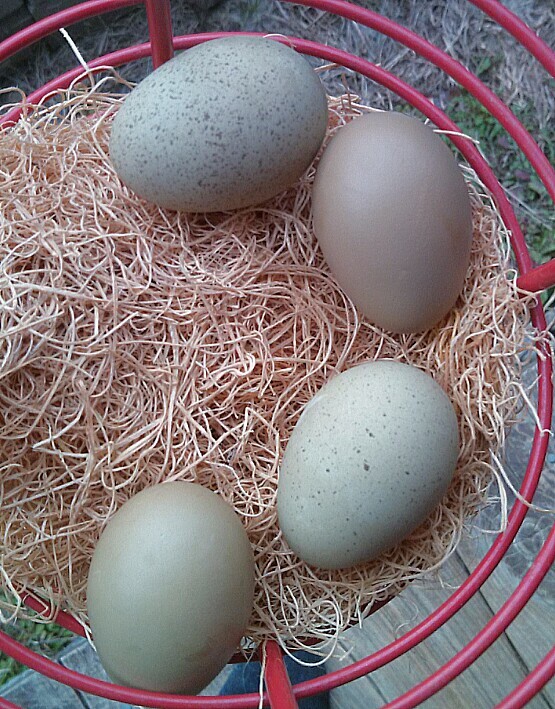 On awakening from a short midday nap, I found our clutch of olive eggers starting to pip. Hubby and son were informed of this development, and cautioned to keep our house cats quarantined in the back room until the hatch was complete. The remainder of the day passed without event, goodnights were exchanged, and everyone settled into bed. At a quarter till four in the morning, we were jarred awake by the shrill tone of fire alarms. Hubby and I flew out of bed. There was no smoke, but an acrid odor permeated the air. A thorough search of the house revealed a burned-out central heating coil--troublesome enough, but no danger of a housefire. Relieved, I returned to bed to catch a couple more hours of sleep, while hubby (the early riser in the family) adjourned to the back porch for coffee. Two hours later, my frantic hubby burst into the bedroom with: "Get up! We got a mess with the incubator!". You guessed it...in the rush and panic of the early morning fire scare, no one thought to shut the cats back in their room. Our Siamese tomcat had toppled the entire incubator to the floor. 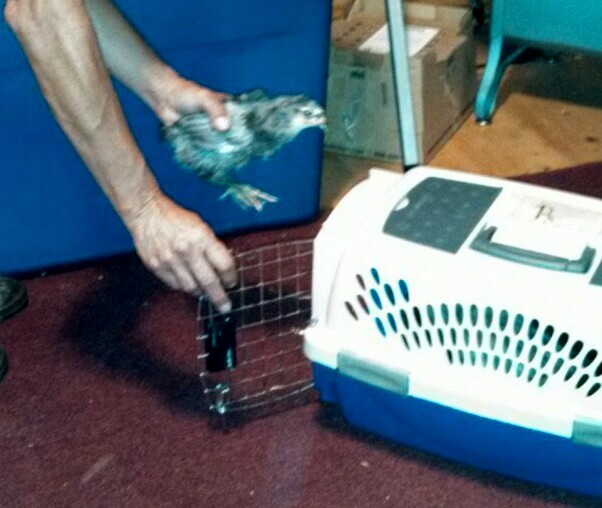 The one just hatched chick survived the fall and had been rescued from the marauding feline. I held out litle hope for the remaining chicks. The eggs were spider-webbed with cracks, bits of shell dropping away as they were gathered off the floor. Already concerned about the viability of this hatch due to unseasonably cold weather and questionable candling results, we debated attempting to continue the hatch. The usual incubation cycle for chicken eggs is 21 days, with the last three days being the most critical. Even small changes in temperature or humidity during that time can ruin a full setting of eggs. But a small chance of survival is better than none, so back into the incubator they went. We hovered and fretted over the incubator the rest of the day. Was the amount of water we added sufficient to keep the chicks moist enough to hatch? Or had we added too much, effectively drowning them in their shells? Could a cracked egg even hatch? By mid-morning, two chicks had zipped themselves out of their shells. Two more, their eggs among those most damaged, had peaked out tiny little beaks, but had given up the effort. The remaining two eggs showed no sign of life. Early that afternoon I decided to assist the two stuck chicks. This is a tricky proposition at best. Peeling away the shell can tear into the small blood vessels lining the inner membrane, essentially causing the chick to bleed to death. It was as we thought. The humidity in the incubator was too low, and the flexible inner membrane of the eggs was "shrink wrapped" to the chicks. After moistening them with distilled water I was able to remove the them, but felt it was too late. The two stuck chicks appeared weak, exhausted and inactive when returned to the clutch. I left for work that evening tired and downcast, but thankful that ANY of the chicks had survived. The clutch was given one more night in the incubator, though I expected the demise of the weak and the unhatched chicks. I felt I would be better able to accept their deaths in the morning. On my return home I was surprised to find hubby and son beaming and happy as they led me to the incubator. The weak chicks were still alive, and the two others had hatched themselves during the night. All seven chicks were alert and active, shoving and tumbling over each other as they cheeped their little hearts out! Can you believe they beat those odds??? Is that a pip I see? It's day number 20 for our olive egger incubation. I have had serious doubts about the viability of this hatch. First, we have had an unusually cold winter for our region, including TWO snowfalls and (yesterday!) an ice storm. Though we had saved our eggs for setting on some of the warmer days we had, I was still concerned that they may have cooled too much to remain fertile. And during the sleet and freezing rain of the ice storm yesterday, I kept my fingers crossed that we wouldn't lose electricity and interupt the incubation in its last few days. The trees of our southern rural forest are mostly pine. Ice collects in the evergreen foliage of these trees, and the weight of that ice easily snaps their soft-wooded limbs or uproots the entire top-heavy tree. The power lines never stand a chance! On the two occasions that I candled the eggs, the results were inconclusive. I was unable to visualize blood vessels either time, and was not convinced that the vaguely darkened area I could see was a growing chick. Difficulty in candling dark and colored shell eggs is to be expected though, as the light just doesn't penetrate as well as it does with white or lighter brown shells. The appearance of an air cell in the eggs was enough to give me hope, and I decided to go on with the hatch cycle (though I half-expected to be greeted any morning with the stench of a burst rotten egg bomb!). I was yet to hear any cheeps or peeps to indicate ready to hatch chicks. I wasn't sure whether the movement I saw of just that ONE egg was from a wiggly chick inside, or a hallucination brought on by wishful thinking. Well, the storm spared us the worst of its ice, and we made it through without losing the lights. On my arrival home from work this morning, I checked the incubator and found...PIPS!!! Yep, 6 of the 7 eggs have that first tiny opening in the shell that's a sure sign there's a lively little chick in there who is ready to get out! And as I'm typing, I'm almost certain I can hear the very faint occasional cheep. I can't wait to watch the process of the hatch as it progresses. Our Brinsea Mini-Advance has a clear dome cover, which is probably my favorite feature of this handy little incubator. 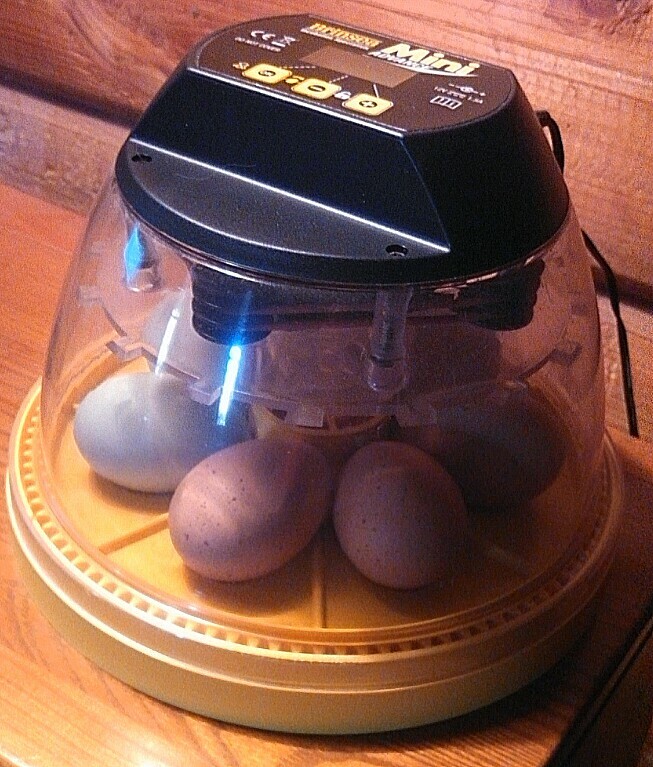 (Read more about this incubator in our product review blog section). And to think I ALMOST threw these little fellows out in their first 2 weeks of development! I'm hoping for mostly hens...I'll keep you posted! Here on James Hill we love our egg basket to be full of colorful eggs. As most of you will remember, we have been working on an egg project to produce "olive" eggs...a richer, deeper color than the sage green that some Ameraucanas and Easter Eggers lay. Our hatching thus far in this project produced two roosters and four hens. That clutch of chicks have matured very nicely, and the hens have started to lay. We are very pleased with the result. 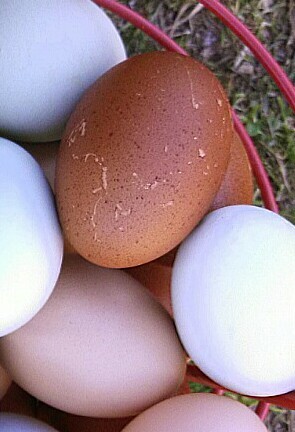 A range of olive colored eggs, including one hen who lays a VERY speckled egg. I am a big fan of speckled eggs, and think they look amazing with the olive green color. The olive green is an extremely difficult color to capture on my digital camera. These are the best pictures I have managed so far, though the eggs have a more green tint in person, rather than grayish as comes through on camera. Still, I think you can see that these eggs are very different than what you will find at the grocers! 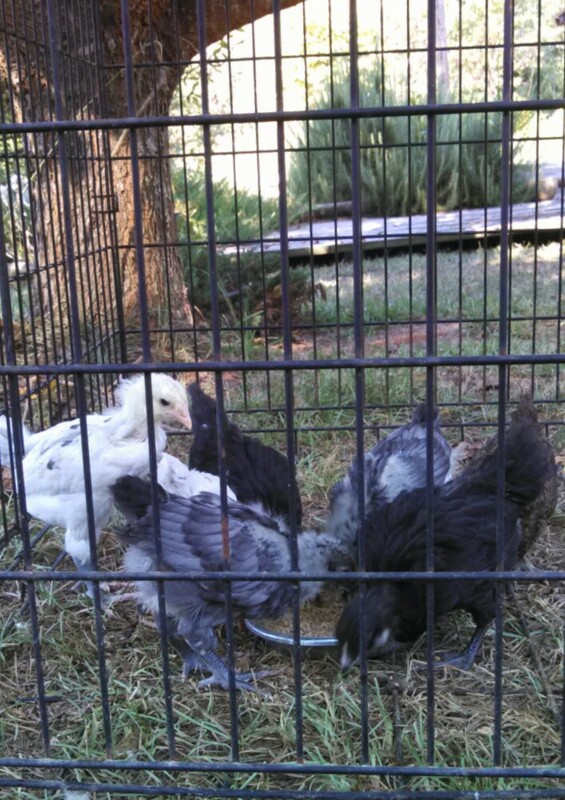 These chickens are a cross of Blue and Black Ameraucanas with Black and Splash Marans. In our experience with Marans and Olive Eggers thus far, the Black and Black Copper Marans lay a much darker brown egg than the Blue or Splash. Since the dark outer coating of the Marans is what gives the olive eggs their unique color, the most "olive" of the eggs come from Black Olive Egger hens. 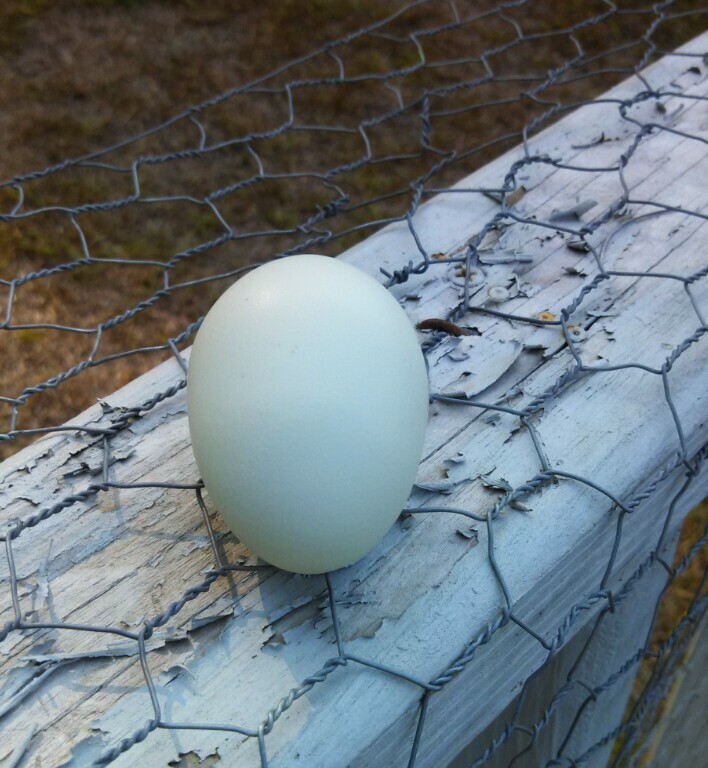 The Blue and Splash Olive Egger hens produce an olive colored egg, just not as deep in color. Of our original six olive eggers that hatched, we lost one of the roosters to predators, and one of the hens to an unknown cause. I had promised a hen to one of our fellow chicken loving friends, leaving us with just a trio of these special birds. But that's OK. We still have our parent stock, so can you guess what's in the incubator right now?!? Colt chose the Polish breed as his 4H project chickens. We ordered from Ideal hatchery. All 18 arrived alive, and all are eating and drinking well. Look at those little poofy heads! 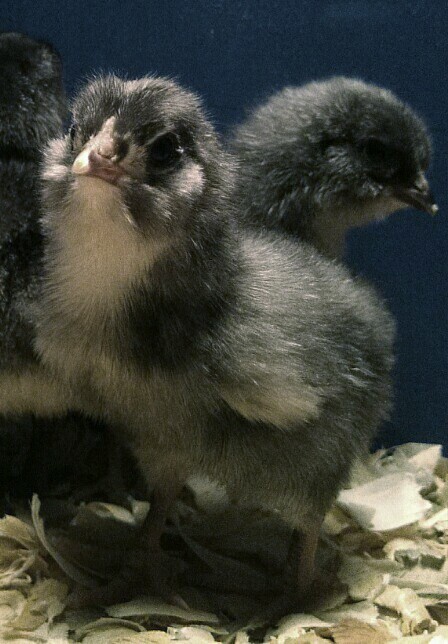 Of the six B/B/S Marans/Ameraucana crosses we set, we hatched two of each color: blue, black and splash. We are still unsure of the sexing on some, though. Those pea combs are the devil to determine early, and I'm no good at vent sexing. We'll just have to wait it out! I'm hoping the splash chicks are both girls. So far, it's been a pretty good day! It has been a very (HOT!) and busy day on our homeplace today. 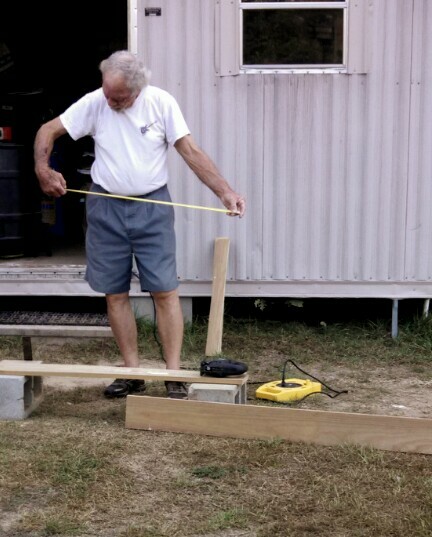 After any early trip to the feed store, we jumped straight in to building an addition to our chicken pens. Hubby says I can no longer use the word "pens" to describe our chicken housing...he says I must use the term "complex"! I must admit there is more than a little truth to his perception. Today we built an additional 8' x 8' run, and doubled the free-range area. What brought this all on was the purchase of a new trio of both Black Copper Marans and Black/Blue Ameraucanas. They are the next step in our "olive egg" project. We settled on those two breeds exclusively for the OE project, and passed our Salmon Faverolles, Penedesenca roo and EE's on to a friend who is starting her own OE/EE adventure. 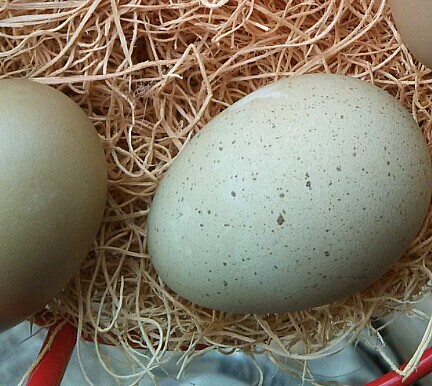 And speaking of olive eggers...did I mention we had a 100% hatch on the seven OE eggs we set? 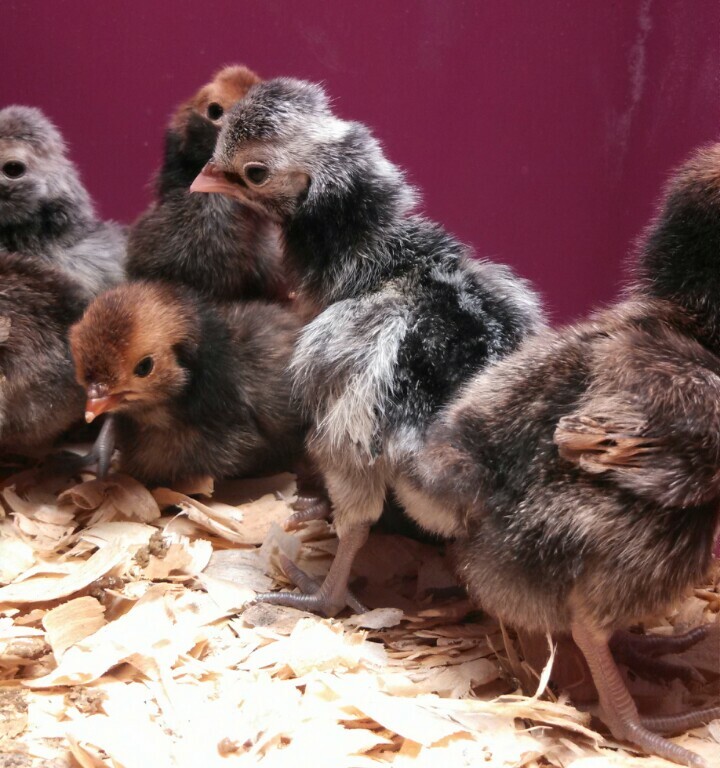 6 of them are Marans/Ameraucana crosses, with the 7th being a Penedesenca/EE cross. It was our first hatch with our new Brinsea incubator, and I can't recommend it highly enough. Incredibly easy to use, just set it and go! Clean-up was simple too. We have a second batch in it now, with 13 days to go (Jubilee Orpingtons, the only other breed we are now keeping). 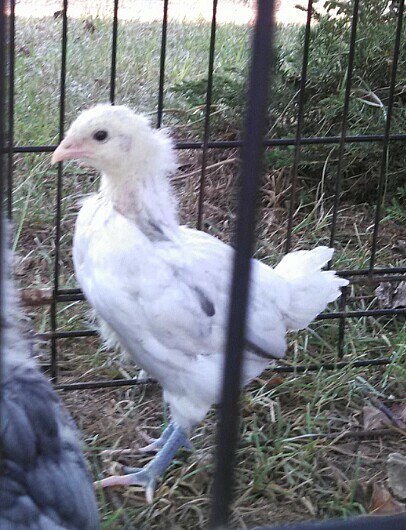 Well, those adorable fluffy OE chicks have GROWN like WEEDS, and are in need of permanent housing outdoors. They are currently sharing our son's bedroom, and now that they are getting older, louder and smellier, he is ready to issue an eviction notice. We should have the run construction finished up tomorrow, though they will have a temporary coop until I can complete their permanent house and landscaping in the free range area next week. If my camera doesn't melt in this Louisiana heat, I'll post some pics of the newest additions to our flock tomorrow! Watched the birds snacking on mulberries while having my morning cup of coffee on the porch ( ignoring the goats loud assertions that they would starve before I finished...they didn't ;)). Cedar waxwings, several grosbeaks, and a pair of flickers flitting all around the tree looking for the ripest fruit. 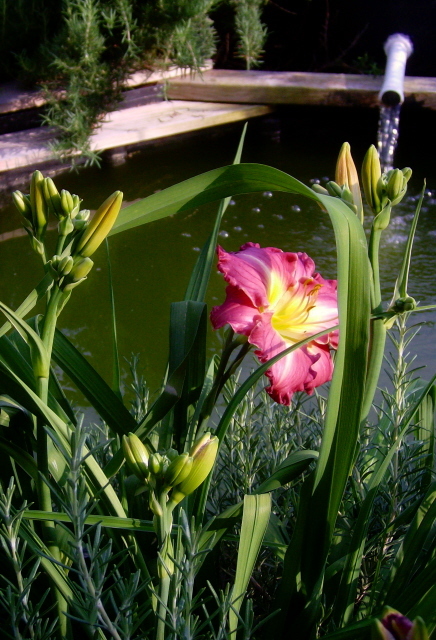 The first daylily of this season opened in our garden today. I love the color! After I finished the morning milking, I potted up the Stevia and Portulaca I purchased last week. The beautiful weather and all the outdoor activity inspired me to mix up a batch of soap that I have been wanting to try. I developed this soap recipe specifically with gardeners in mind. To our basic goat milk soap I added finely ground pumice to scrub away dirt and grime, with dried lemon zest and lemongrass essential oil for a cheerful, refreshing scent. Tomorrow I will take it out of the mold and cut it...then try to be patient for 4 weeks while it cures! When our hens are all laying, we often have more than we can use and give away eggs to our friends and family. This weekend one of my co-workers mentioned that she had been surprised by a "double-yolker" in the last dozen eggs we had given her. It wasn't a surprise to me, as we have one hen who manages to lay an oversized egg every other day. Imagine her scepticism when I told her that we DIDN'T send the biggest egg we had gotten so far. So Amber, this picture is for you. I wonder if it may actually turn out to be a triple-yolker?? ?